Construction workers deal with design changes, logistics issues, sales calls, and client inquiries. 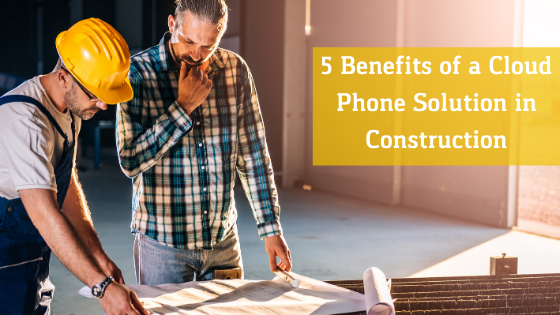 Delays on projects can damage a contractor’s reputation and missed calls can cost big bucks. Contractors need an efficient, effective communication system to successfully manage multiple projects. A cloud phone solution can enhance your operational workflow, improve productivity, enable you to deliver top-quality service, and increase your bottom line. With multiple job sites and various projects in progress, on-site communication is essential. A cloud phone system makes it possible. Adding an extension for each job site is easy, stress-free, and cost effective. No IT expertise is required to set it up or maintain it. The construction industry employs a large number of remote workers. Their work requires them to move between various job sites on a daily basis. Staying in contact can be challenging. The features of a cloud phone solution make keeping in touch at all times possible. No matter where your work takes you, this communication system keeps you connected to your voicemail, email, contacts, and faxes. Never miss a call or message again! AutoAttendant: A virtual receptionist that can automatically screen and direct calls to the appropriate person. Find Me Follow Me: Route calls to mobile phones, landlines, or even a computer. Conference Calling: Conveniently collaborate with multiple contacts at once from anywhere. Call-Back: Callers never have to wait on hold again. Shorten call times and keep customers happy. Call Forwarding: Eliminate hold wait times for callers; never miss an important call. Voicemail to Email: Never check your voicemail on your phone again! Be the master of your messages, giving callers the freedom to contact you by phone while having the flexibility and time you need to get your work done. Cloud Faxing: Send & receive faxes anywhere and at any time without a fax machine using a mobile device or computer. Collaboration between clients, suppliers, and employees across multiple sites is essential for successful construction project completion. Effectively communicating ideas, discussing changes, or updating project status consumes a vital part of your workday. A lack of effective communication can be costly in both dollars and time. A cloud phone solution offers various features to assist you in communicating internally with employees or externally between subcontractors. Whether it’s a multi-site conference call between crews, a document exchange via cloud fax, or a one-on-one conversation with a client, our system helps contractors build stronger relationships in every aspect of business. A cloud phone solution is the most cost effective communication system available. Enterprise features are included in all pricing plans. Contractors come and go regularly. As projects are continuously being added or completed, the size of your operation is always subject to change. A cloud phone solution makes it easy. Add and remove new users directly through your own online interface whenever, wherever, and as often as required. A cloud phone solution is the communication system your construction business needs. Support your remote workers, promote effective communication, enhance your operational workflow, improve productivity and customer service, and increase your bottom line. Contact a UnitedCloud specialist to find out more about how our solution can work for you.